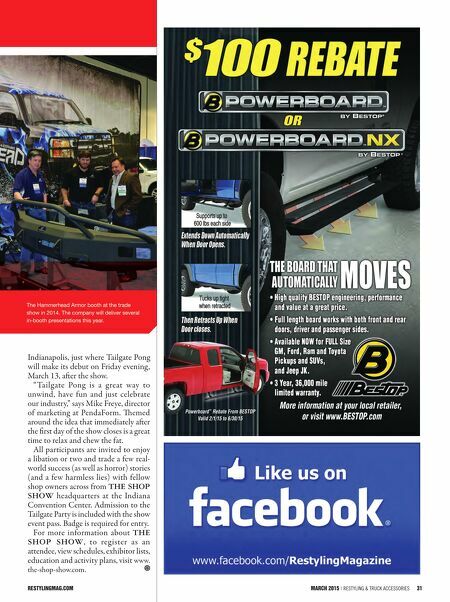 restylingmag.com March 2015 | Restyling & tRuck AccessoRies 31 Indianapolis, just where Tailgate Pong will make its debut on Friday evening, March 13, aer the show. " Tailgate Pong is a great way to unwind, have fun and just celebrate our industry," says Mike Freye, director of marketing at PendaForm. emed around the idea that immediately aer the first day of the show closes is a great time to relax and chew the fat. All participants are invited to enjoy a libation or two and trade a few real- world success (as well as horror) stories (and a few harmless lies) with fellow shop owners across from THE SHOP SHOW headquarters at the Indiana Convention Center. Admission to the Tailgate Party is included with the show event pass. Badge is required for entry. For more information about THE SHOP SHOW, to reg ister as an attendee, view schedules, exhibitor lists, education and activity plans, visit www. the-shop-show.com. Powerboard ™ Rebate From BESTOP Valid 2/1/15 to 6/30/15 bestop_restyling_1-2_vert_mar_15.indd 1 2/11/15 11:49 AM The Hammerhead Armor booth at the trade show in 2014. The company will deliver several in-booth presentations this year.